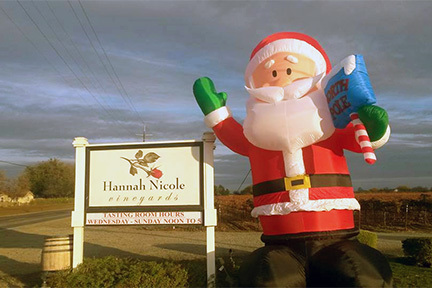 The folks at Hannah Nicole Vineyards and Winery in Brentwood are seeking the public’s help in locating a 30-ft Santa that has gone missing. According to the Hannah Nicole vineyards, the Santa went missing on Saturday evening and he has not been seen since. The blower and plugs that keep Santa in place were also taken. This was the third year they had the Santa. Santa got kidnapped ? Could it be the Grinch ? What happened to East County ? It use to be so safe and friendly. It’s sad that some people will steal anything, and we have to worry about everything being stolen. It’s the society we live in. Lo life ghetto trash has reached far east county. P’oS. No respect for themselves or anyone, just trash porch monkeys. Porch monkey is a racist term. Looks like you’re the trashy one. You have no idea what the perp looks like, but it’s always refreshing for racists to reveal themselves instead of being covert. Maybe it was a competing winery, or some “good ol boys” with their loser confederate flags. So you’re criticizing others for being discriminatory by being discriminatory yourself? Hypocrite much? All we know is this person is a THIEF. Pretty much since the whole movement to defend the confederacy is built on racism and discrimination. People who support the confederate flag support losers who lost the war, and wanted to destroy what the United States was founded for. So I’m guessing you defend the neo-Nazi’s too Nick?? Hey Jerry – You’re a whack job on every thread. Geez, Jerry, get a grip!